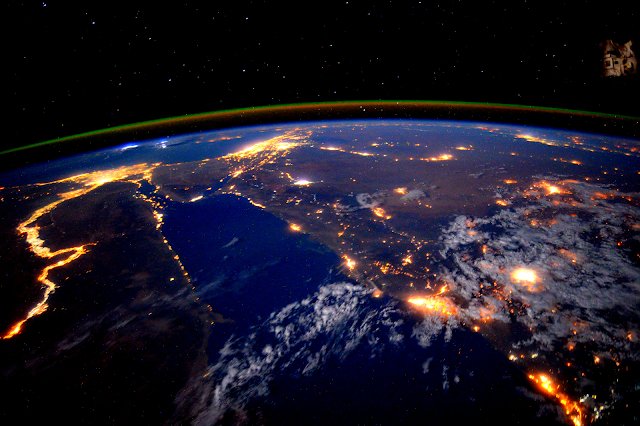 NASA astronaut Scott Kelly photographed the Nile River (left side of photo) during a nightime flyover on the International Space Station on September 22, 2015. Someday in the decades ahead, all of the lights seen in the photo will be powered by renewable energy. Below is a roof garden and the second photo is an "Adopt-a-Plot, both located at the Research Institute for a Sustainable Environment (RISE) at the American Univeristy in Cairo. Welcome to Sustainable Egypt, the blog of The Directory of Environmental Organizations and Environmental Government Agencies in Egypt. The purpose of this blog is to provide information on sustainability, environmental and conservation issues in Egypt, and to also be a fun blog to look at. My name is John Brainard and I'm the editor of the blog. My niece, Starr Brainard, is living in Cairo for the third time in her life and she provides photos, some data & links, and may even write some posts for this blog. Now to get started, bicycling is one of the most sustainable means of transportation, and my favorite video of biking in Egypt is this video of cycling through downtown Cairo in 2010. If you don't think that cycling is exciting, this video will definitely change your mind. Click on link below if video doesn't function. The "Environment" section of Egypt Independent. Sustainable Transport for Plants in Cairo! A Cool Sustainable Transport Vehicle in Cairo! Save Egyptian Street Dogs! Donate to "HOPE - Egyptian Baladi Rescue & Rehabilitation"
Copyright 2015 - 2018 by U.S. Environmental Directories, Inc., All Rights Reserved.. Simple theme. Powered by Blogger.